Iguazu Falls, straddling the Brazilian and Argentine borders to the north, are an awe-inspiring sight. 270 individual cascades, from serpentine streams to the mammoth Garganta del Diablo (Devil’s Throat) loosely form an arc of plummeting water as the Rio Iguazu drops into the gorge. While the trip to the park was spectacular, including a boat ride that takes you directly into dump zone of a medium sized cascade, our full moon visit to The Devil’s Throat was even more impressive. Brendan and I met in my intensive language lessons in Buenos Aires. Coming from Australia, he had decided to spend his semester break from medical school volunteering at a hospital in the impoverished neighborhood of La Boca. Between language courses and his work he was pretty tied down, but he decided to join me on a two day trip to northern Argentina to visit the Falls. Our trip was evenly split with 36 hours on a bus and 36 hours with feet on the ground, including the hottest night of my whole five month trip. Argentina has a very extensive bus system that is quite different from most countries. From the central terminal in Buenos Aires hundreds of bus lines will take you almost anywhere in the country in “Sleepers” – buses with the option of a chair that goes completely horizontal. In addition to blankets, pillows, movies, the meals sometimes come with complimentary alcoholic drinks. Overall the experience is more like a first-class flight than a bus. Leaving Buenos Aires we were reminded of the vast difference between the city and the country. Argentina is still a third world country no matter what impression the city gives to visitors and residents. In the seven hours of light during our trip we passed countless miles of uninhabited land; a few outpost towns with scattered and tattered houses; and minor cities. While a flight would have been only an hour, I feel the road experience is a valuable part of any trip; sometimes it is the trip. 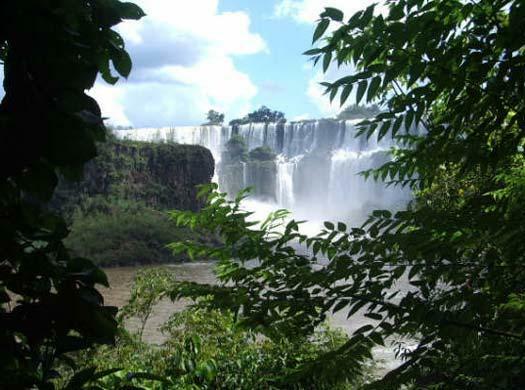 When we arrived in the small town Puerto Iguazu in the early morning, the expansive brown-grey fields of the previous day had become semi-lush greenery with chalky, red soil. Setting off to find our hostel, whose name and location I had managed to forget, we ran into four drunk Irish girls who were walking home from the bar and being true ambassadors of their country they invited us to drink from the bottles of wine they were carrying. Dutifully, Brendan and I accepted and shortly thereafter found ourselves being asked to leave the pool at their hostel by the woman at the front desk. It was now around 7:30 AM so we walked around the corner and checked into one of the many hostels that pepper the area surrounding the bus station. We fortified ourselves with some peanuts and packed our bags to make the day trip to the falls. 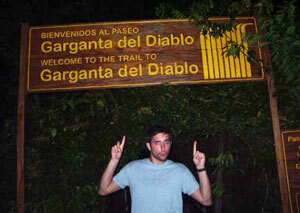 We took the jungle tour, the boat tour, and rode the little train out to the Devil’s Throat. It was all excellent, but we had to catch a bus back to our hostel in order to eat some food before coming back for the Moonlight Tour – one of the more coherent suggestions the Irish girls gave us in the morning. Luck had been with us as we had no idea that during the four days surrounding the full moon the National Park opens itself up for organized moonlit tours of the falls. Gathering at the entrance of the park with some fifty other people, along with countless nagging insects, the woods had a different feel. It was unlikely that we would see one, but this was jaguar country. With our guides leading the way we boarded the small train that winds itself through the park, providing transit from the entrance to Devil’s Throat, which otherwise is an hour’s walk. To get to the platform that overlooks Devil’s Throat you need to cross a number of river-spanning footbridges. In the middle of the night, in the middle of the jungle, in the middle of a 3 km wide river which forms the falls, with both shores invisible and a few scattered island in sight, Brendan and I stopped and let the herd of tourists pass. We stood there appreciating the solitude, the grandness, and the downright alien feeling. The flowing water beneath us and sound of bending fronds and shaking branches in the wind was a little unnerving, and made us feel pretty small and out of our element. 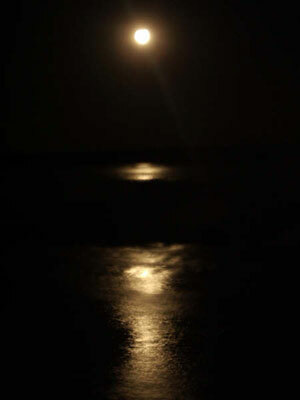 While we were walking on the last stretch of bridge, the beam of moonlight skating across the water’s surface on our right suddenly fragmented. From this distance, Devil’s Throat was the black hole interrupting the continuous moonbeam. At the final platform that extends slightly over the drop we could see a little more, but still were left with a mostly auditory experience and the strange realization that all during the night Iguazu churns, even when nobody is here to see it. If everything on the earth were removed except for water and gravity, it would still exist. I realized how glad I was to be here, especially with the prediction that they might run dry within fifty years. Night tours are only available the four days surrounding a full moon. Generally, each of these nights there are three tours. The final tour puts you at the Devil’s Throat around midnight, but it is the first of the evening that gives visitors the best view of the falls because the moon is at its lowest point. The information for the tours is available at the National Park itself or through most the tourism offices of hostels and hotels. Sleeper bus tickets, which are purchased at the Omnibus station next to the Retiro train station (you need your passport), range from 150-180 pesos and depending on the bus line will depart and arrive at different times. It is always suggested that you purchase your tickets at least one day in advance. This page rendered in 0.758 seconds.